On Sept. 11th, 125 people who worked at the Pentagon were killed when a hijacked jetliner rammed into the building. And, as CBS News national security correspondent David Martin reports, it was pure fate that intervened for everyone inside, with decidedly different outcomes, depending on the person. The plane hit the west wall of the Pentagon and tore a 270-foot path of destruction through the building. Feet and inches, and just plain luck, were often the difference between life and death. 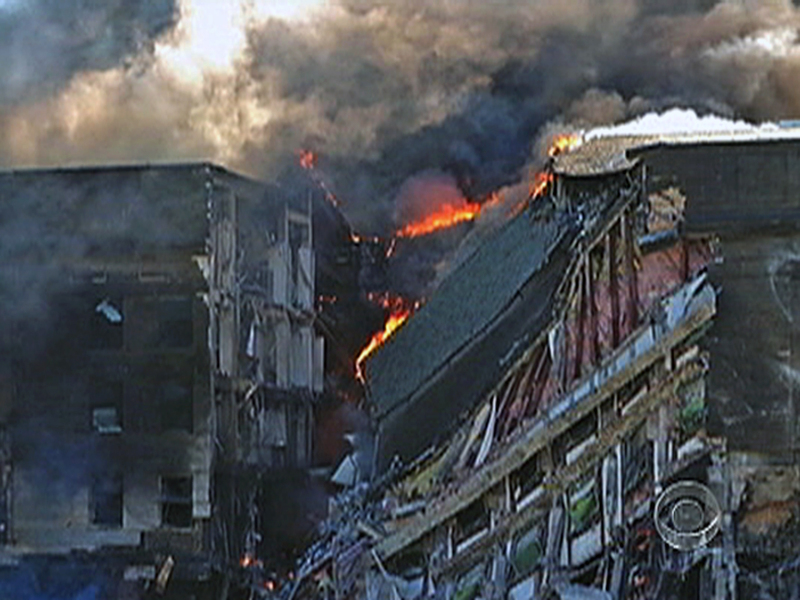 Most people in the pentagon were transfixed by the televised pictures of the burning towers in New York. "After some period of time watching it," says Rear Adm. Frank Thorp IV, who has since retired, "I came to realize, 'Hey, we've got this big project due.' So I said, 'Hey, everybody, let's get back to work." Then Thorpe, at the time a Navy officer, changed his mind. "For the first time in my life, I said, 'But first, let's all go get a cup of coffee together.' To this day, I have no idea why I did that. All of us got up, walked out of the Pentagon or walked out of the office, walked down the hallway, and the plane hit about a tractor-trailer's length away from my office." For Admiral David Thomas, fate broke the wrong way. He knew his Naval Academy roommate was somewhere inside the black hole where the plane had punched through into an interior driveway. The Navy Operations Center was in there, and Thomas had just called Bob Dolan to say they'd better skip their morning coffee break and remain at their desks. "My best friend in life was on watch in the Navy Operations Center," Thomas says. Thomas says he went in that black hole, to where "my best friend's desk should be, in the middle of this big room ... and I'm screaming for my friend. I'm screaming for anybody, 'Is there anybody in here?' And this horrific smoke is starting to get blacker and thicker." Thomas was able to rescue other people from the black hole, but he never found Dolan. "He was killed at his post in the Pentagon," Thomas notes. ... "He was the best man I ever knew. In fact, he was the best man at my wedding, and he died that day and so . . ."
All-told, 184 people, both in the building and aboard the plane, had their lives stolen from them on Sept. 11th.